It is nearly ten months since Sadiq Khan won the London mayoral election for Labour, defeating the Conservative candidate Zac Goldsmith. As readers are likely to know, he promised to meet the demands of the London Cycling Campaign, most importantly including building more cycle Superhighways to triple the provision of segregated space on London's roads in four years, and extending the mini-Holland programme to every borough. Since then, it's all been very quiet. There was no immediate replacement for the last Cycling Commissioner, Andrew Gilligan, and, other than an announcement that the (largely back-steet and non-segregated) extension of Superhighway 6 towards St Pancras planned under Gilligan would go ahead, there have been no announcements of any definite new plans for cycling. A new bridge across the Thames from Wapping to Rotherhithe, promised by Khan during the campaign, has been mentioned by him often (along with pedestrianisation of Oxford Street, the effects of which on cycling cannot yet be predicted), but other than that, cycling affairs seem to have been in deep-freeze. Of the other two Superhighway schemes consulted on just before the election, there have been non-commital statements on CS11 to Swiss Cottage, which received public approval in the consultation and so is a scheme that was 'ready to go', while the plans for CS 10, the extension to the East-West Superhighway from Lancaster Gate to West London have vanished without trace, with not even any report on the consultation ever published. I've refrained from commenting on this hiatus, as the new Mayor needed time to get his feet under the desk, select his team and come up with his own strategy after assessing the results of what the last mayor had done. However, it has been deeply frustrating seeing such a successful programme apparently grind to a halt. 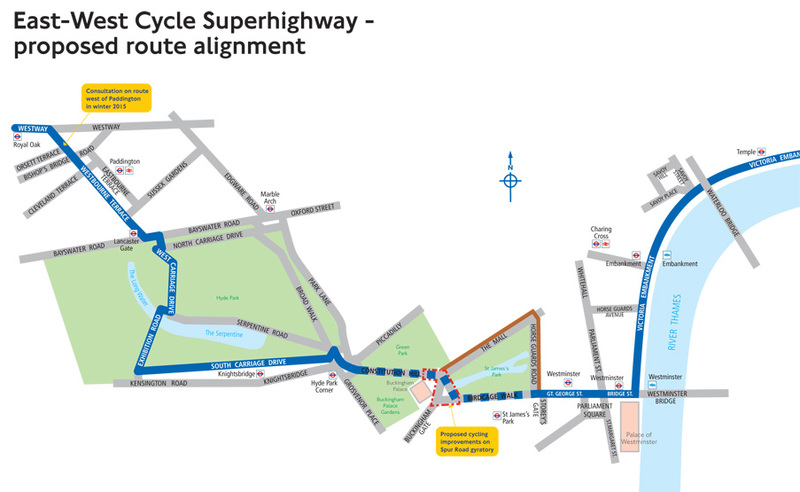 Even the work that needed to be completed on CS 3, the East-West Superhighway from Parliament Square to Westbourne Grove that was already programmed, seemed to be taking for ever, with nothing new definitely in the pipeline. The Mayor announced a £770m budget for cycling for the next five years, but how could this possibly be spent? At Nike, Will has spearheaded a programme to make physical activity a global policy priority... Among his work has been a partnership with UNESCO and the German Development Agency GIZ to successfully reform physical education in South Africa, bringing activity and sports to thousands of primary school children for the first time since the 1990s. Others who had applied for the job had been leaders in local government, campaigners, journalists, architects, planners and engineers. The choice of Will Norman was a surprising one, given a slight nebulosity of his connection to the subject in hand, that is, as I would characterise it, physically planning better walking and cycling conditions in London, and working politically to put such plans though the labyrinth of relevant controlling bodies. Still, Andrew Gilligan was perhaps no more obviously fitted to the role when he started, and yet he did achieve quite a lot. So we were all very excited to hear that, soon after being appointed, Will would speak to a meeting at which we could attend and ask questions. Even better, he would do so with Val Shawcross, the Deputy Mayor for Transport. 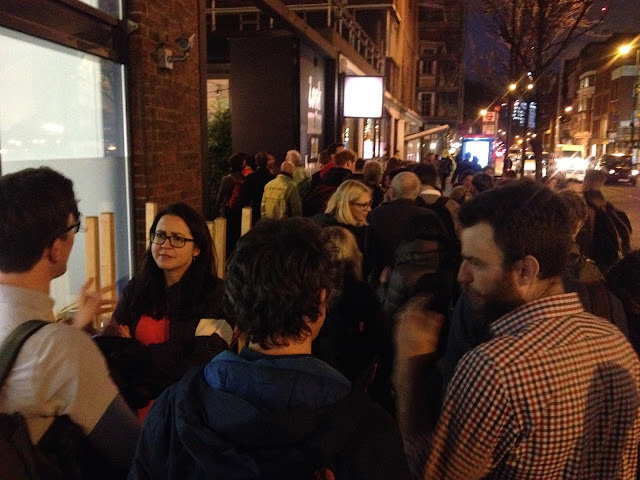 The meeting was part of the Street Talks programme, started by Bruce McVean and colleagues in a Holborn pub, and later taken over by Sustrans London. It took place last Wednesday at Look Mum, No Hands café. It was completely booked out, and I am sure a much larger venue could have been filled, such was the level of interest. Virtually everyone known for their interest in cycling in London was there, including Andrew Gilligan, the last commissioner, and another transport expert who many thought might get the Commissioner job, Christian Wolmar. Such was the high level of interest in this meeting people were queueing in the street. The chair seemed to believe there would be some sort of debate in the room about the basic desirability of changing the city to enable higher levels of cycling and walking, which showed how out-of-place he was. (Apparently he was an employee of 'The Prince's Trust, whatever that is). It may be worth recalling that the first time Andrew Gilligan had addressed the public after his appointment, he already had a quite specific 'Vision' document he had written with the Mayor to show campaigners, and he was announcing brand-new and highly-ambitious schemes, such as 'Crossrail for the Bike' (which became CS3, and got built), a 'Bike Grid for Central London' (which did not really happen), better Superhighways (which happened at CS3, CS5 and CS6, but not CS1), a 'Jubilee Line Route' from the West End to Wembley (which did not happen), and 'Mini-Hollands in the suburbs" – three of which happened, though only one of which, the Waltham Forest one, is yet really impressive. So compared to all this promise in 2013, the Shawcross-Norman act at Look Mum, No Hands in 2017 was insubstantial indeed. Gate closures will happen if that's what we need to do, but we are looking at alternatives for a safer park. What could that possibly mean? It seemed that she was considering a segregated track for cyclists. Now, I am one of the world's leading supporters of segregated cycle tracks, as the whole of this blog testifies, but I can't really see how one on the Outer Circle of Regent's Park would solve the problems there. It might reduce traffic speeds slightly, by restricting space for motor traffic, but it would not reduce traffic volume in the park as closing gates selectively would. Of itself it would not facilitate pedestrians crossing the roads. It would not provide the space that the sports cyclists need for their circuits; it would be a disaster for them, as they would be squeezed on to the narrowed road space. The only way to make a track wide enough to cater for utility, commuting and sports cyclists of all types would be to make it the width of the whole road (minus the car parking) – in other words, to go back to the idea of having an unsegregated road, with no through motor traffic on it. 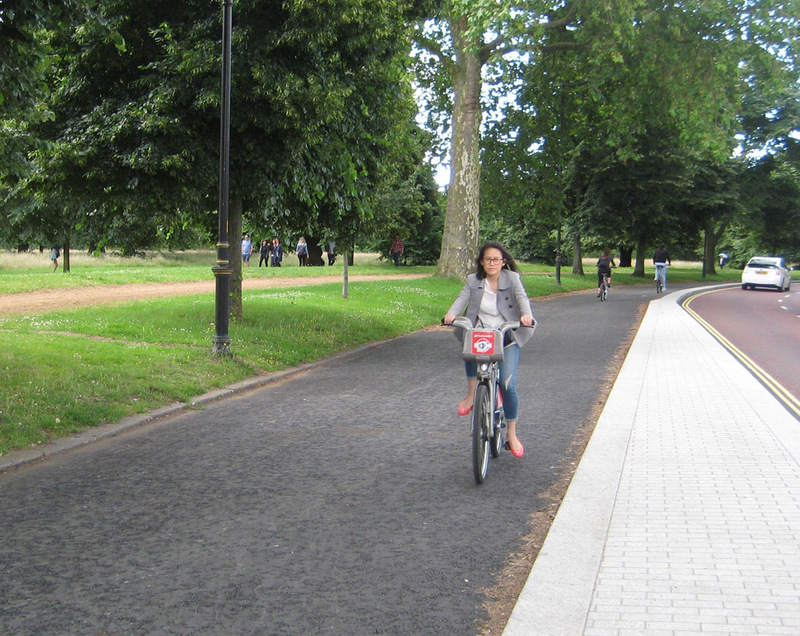 No-one campaigning for the implementation of CS 11 wants a cycle track solution in the park. The suggestion of it by Shawcross now might even be seen as a cynical attempt to split the pro-CS 11 lobby by driving a wedge between the utility cyclists, who would benefit from the track, and the sports cyclists, who would disbenefit. A track would do nothing for the pollution levels in the park, which would continue to be a taxi rat-run. Without the closure of Macclesfield Gate, there will still be too much traffic on Avenue Road between Swiss Cottage and the park for it to act as a safe or inclusive Cycle Superhighway. The whole scheme will be ruined. A cycle track on the Outer Circle is a non-starter. Why is Shawcross raising this possibility at all? Why not just get on with the already consulted plan? It makes no sense to say that the safety of park users is a top priority, and then keep the Outer Circle open as a rush-hour rat-run. Other questions came on development issues such as the Olympic Park, where the cycle infrastructure built on this blank slate site has been highly disappointing, and Old Oak Common, which is another stalled mayoral development project. Again there were no details forthcoming. I don't suppose Norman has had time to look at any of this yet, so it is not surprising. But what I might have expected, reasonably, I think, from him and Shawcross was some more strategic indication of where they would be going in relationship to how cycling had been left by the last administration. What did they think of the facilities that have been built? What did they think had worked, what had failed, and why? What should be improved, what, specifically, are the next steps in making 'London a by-word for cycling', as Sadiq Khan has promised? We really didn't get this. We did get a statement from Shawcross that the Santander hire scheme (AKA Boris Bikes) would not be expanded, as it is too expensive to do so. We didn't get any commitment to review the rather modest target of achieving 1.5 million cycle journeys a day by 2021. There were some stranger thing in the meeting. One questioner referred to the high-pollution days we have been experiencing in London, and asked, 'Rather than tell people not to go out and take exercise, why can't you tell people not to drive instead?' All the audience understood what this was about, having seen tweets along these lines from TfL, and applauded the question. But Shawcross bizarrely misunderstood, despite lots of people trying to should out to explain it to her. This was a question about messaging, but she interpreted as a question about closing roads locally, or more widely, for 'car free days'. She seemed to be quite against these, cv claiming that 'the science is not behind' trying to reduce pollution by closing roads. There was a ruckus. There was more disbelief in the audience when it transpired that the Chair didn't know what mini-hollands were. It was like being at a debate on medical ethics where the chair had never heard of stem cell research, or something like that. Shawcross and Norman merely putting to the meeting a broad view on making streets better for cycling and walking, without any firm proposals for particular locations, might have been seen as fair enough, except that the problem was (and I have Shawcross more in my sights here than Norman, as she has been in post for much longer, and is an experienced politician) that they were talking as if they were starting from nothing, as if the last administration had not also had strategy on these things, and had not done quite a bit of good. They were not acknowledging this. They were talking as if an active travel agenda had to be created for the first time ever, and not as if the main issues had been gone into already, and many problems found, particularly with realising such a vision with the fragmentation of authority between the Mayor, the boroughs, the Corporation, the Royal Parks, the Canal and River Trust, other bodies, and opposition from powerful versed groups. They were not telling us how they hoped the new administration might overcome issues that the old one could not, such as the blockages caused by the critically-placed anti-cycling councils in Westminster and Kensington & Chelsea. I had already asked Val Shawcross about CS10, the extension west of the E-W Superhighway, at a meeting last year. She had said then that TfL were 'looking at different options to decide a way forward'. 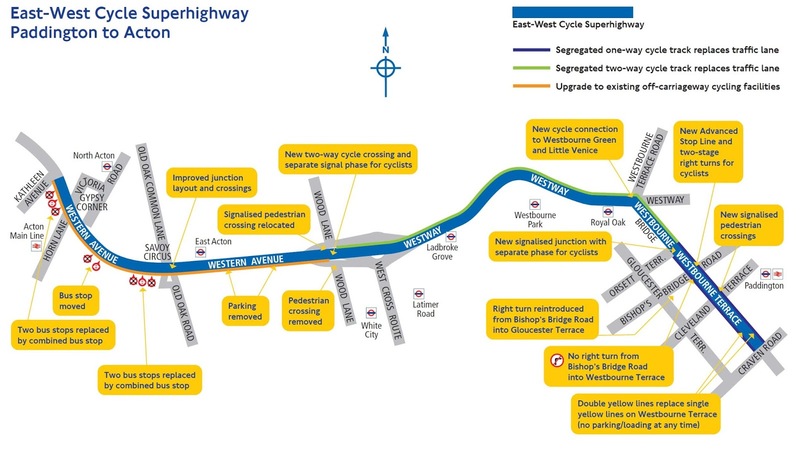 We all know however there are no options other than the plan which was consulted on, to create a cycle track on the elevated Westway, as all the other roads west out of central London are, at least in part, controlled by the Royal Borough of Kensington & Chelsea. We got no more information on this, leading one to suspect she and TfL have no more clue about it. The Superhighway has now been built as far as Westbourne Terrace. This is where it was meant to join the Westway. It is now just going to end at the huge, awful junction of the A40 and Harrow Road, where cyclists will have n-where further to go. I am genuinely fearful about this. The Superhighway from the parks will attract many hire-bikes and tourists, who will end up at this point and be abandoned. I really fear bad things will happen at the end of the Superhighway at Westbourne Terrace. Coming up with no solution here is a dereliction of duty on the part of Sadiq Khan and Val Shawcross. 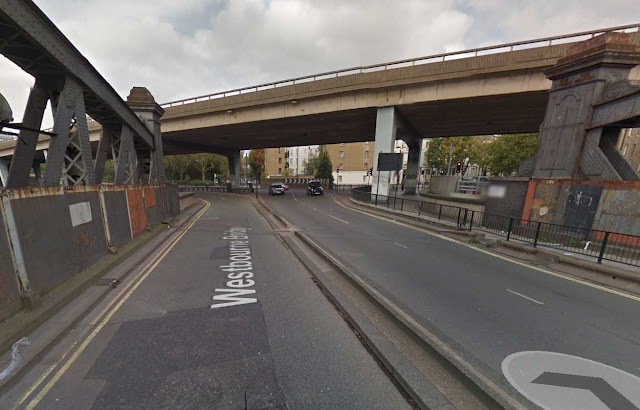 ...to here, Westbourne Bridge, where the Superhighway should have gone on to the flyover, but now will just run out. Will Norman, from my first brief engagement with him, came across as personable and able to talk to a crowd. He seemed like a nice guy, but I wonder if he knows what he's got himself into. I am worried he could become a fall-guy, the person angry meetings, of similar composition to the meeting at Look Mum, No Hands, shout at over the next three years at as the Mayor fails to deliver on his cycling promises, but who lacks the influence or political heft to do anything about it. The huge advantage that Andrew Gilligan had was that Boris Johnson did back him, and never undermined him, never put him out front to take the flack for decisions he wan't responsible for. The Heathy Streets agenda that Shawcross and Norman were promoting sounds good in theory, but how will it collide with the political reality of the opposition they will get to any attempts at reallocating space on the roads or changing the functions of roads, demonstrated so clearly by the totally unreasonable opposition to CS 11 and the Regent's Park gate closures, and the numerous failed Quietway schemes around London, where councils didn't believe their residents would support the closing of streets to through motor traffic? It sounds as if the Healthy Streets initiative could easily descend into a programme of uncontroversial prettification. We could easily get the benches, more trees, nice paving, a few extra crossings, and no reduction in motor traffic, and no more high-quality space for cycling. Sadiq Khan has made a much bigger 'thing' than his predecessor of tacking the life-threatening air pollution we suffer from in London, in his speeches, at least. But what has he actually announced after 10 months in the job? He has announced a higher rate of congestion charge on a rather small number of the most polluting cars entering the very small area of the central charging zone. The response so far has not been in proportion to the problem, or the rhetoric, and Shawcross's comments on the undesirability of closing roads as 'Not supported by science' indicates such 'big talking' coupled with political timidity is likely to be the pattern for this administration. 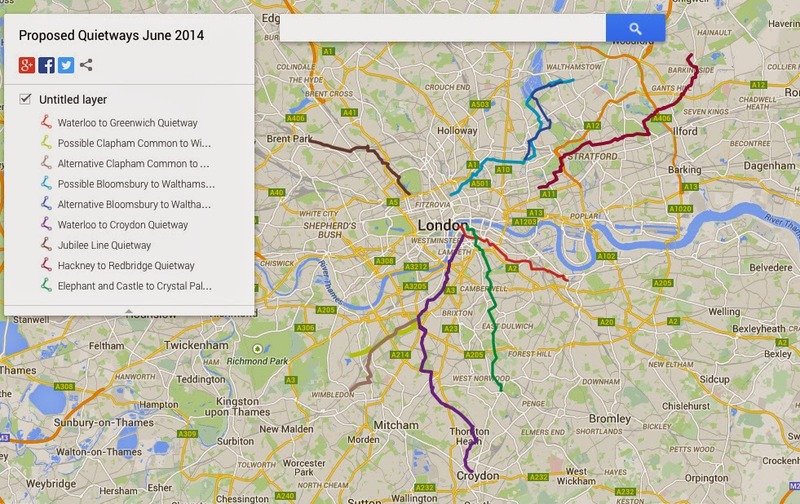 The Quietway routes promised three years ago: only Waterloo to Greenwich has happened in any meaningful sense. A change from the previous Mayor's policies would be, Shawcross told us at the Look Mum, No Hands meeting, that there would henceforth be a 'hierarchy' of consideration for the streets. Pedestrians would be at the top of this, followed by people on bikes, followed by bus users, followed by taxi users, with private motorists last. I'm afraid I'm not impressed with this talk. I've been listening for a quarter of a century to statements along the line of 'It is the policy of the London borough of Brokenham to priorities the need to pedestrians and cyclists above those of motor traffic'. These empty 'hierarchy' promises are easy to make to rooms full of active travel experts and enthusiasts, and always have been, they but don't often translate into reality in terms of space and junction time allocated on the streets for pedestrians and cyclists. They don't prevent you having to press a button and then wait two minutes before you can cross the road, and they don't prevent cycle lanes being ruled impossible due to a 'need' for parking. 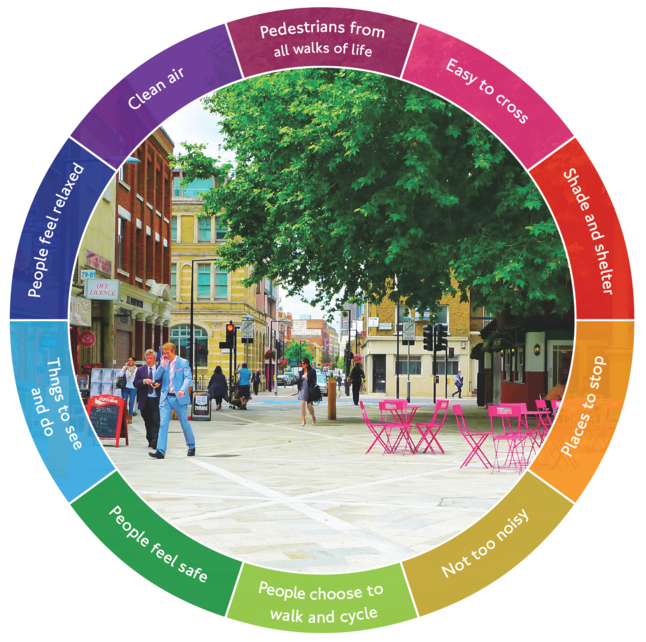 In practice, for nearly every real decision about priorities on the streets taken in authorities which have these stated hierarchies, the hierarchy, when it meets other, sharper political realities, suddenly gives way to a need to 'take into account and balance the needs of all road-users'. I am told, and someone can correct me if it is not true, that there is a room in Transport for London's headquarters (or maybe in City Hall), somewhere at the top of the building, were there are lots of screens and lots of controls. This is the traffic control neve-centre for London. For TfL controlled roads, operators are monitoring traffic and queues, and they are trying to optimise traffic flow. This means the flow of motor traffic, not the flow or pedestrians or cyclists. They are making adjustments to signal timing all the time to try to keep the motor traffic flowing. They are reducing timings for pedestrian crossings where they feel it is necessary to reduce queues of motor traffic. They are explicitly prioritising cars over people. If all this is true, then I expect Shawcross and Norman to go to these people, and tell them, in future, they are going to have to do something different. If they don't, or can't, I am afraid I think we are being told fairy stories about this Mayor's approach to transport. All astute points. Were they raised as questions in the meeting, including by the previous commissioner? No doubt Khan, Shawcross and Norman have all been given ‘the talk’ on their respective first days: the TFL permanent civil servants are already the crème de la crème, but everything is very finely balanced and woe betide any here today & gone tomorrow politicians interfering with our customs and practices, blah, blah. What number or proportion of TFL employees are they prepared to sack to bring about the changes they claim to want and prevent these being lost with the next change in administration? Which district council highway departments are they willing to shut down or put into special measures to overcome obstructionism? I believe the [motor] traffic control room is/ was in Palestra. My responses to all London cycling consultations for years have included a suggestion that TFL actually prioritise walking, cycling and public transport above private motor vehicles at their motor traffic lights, i.e. default-to-green for cycle tracks, at minimum. No indication that anyone has ever even read these so far… If you felt frustrated by this meeting, just wait 'til you find out how much of the cycling budget is blown on introducing SCOOT in the vicinity of cycle ‘schemes’. About £770 M—minus Will Norman's salary, etc.—over the next five years, by the look of it! So, just the ten years after Manual for Streets was published and TfL show how they are the UK's leading experts in managing traffic by joining every other highway authority in the country in finally adopting the user hierarchy. Well, I say adopting, writing into a policy document and ignoring thereafter will be more accurate, if the rest are anything to go by. Khan and his stooges are full of crap. LCC and others need to start organising Space for Cycling demos again. We need to get people out on the streets. These lying bastards are selling us out. I've noticed there is a long-term anti-cycling and anti-cycling facilities (anti cycling lanes, anti CS highways) in the Evening Standard letters page. Every week there's someone calling on the mayor to remove the new path from Parliament along the embankment, or to take away other cycling lanes to prevent congestion because doesn't everyone know that these cyclists are just causing more trouble than they are worth and so on and so on. I think these might be from taxi drivers or a taxi lobby or who knows, but the ES has a massive circulation and I wonder if the mayoral team are getting propogandised from all the crap in the letters page? If they are, they need to get informed, and quickly. 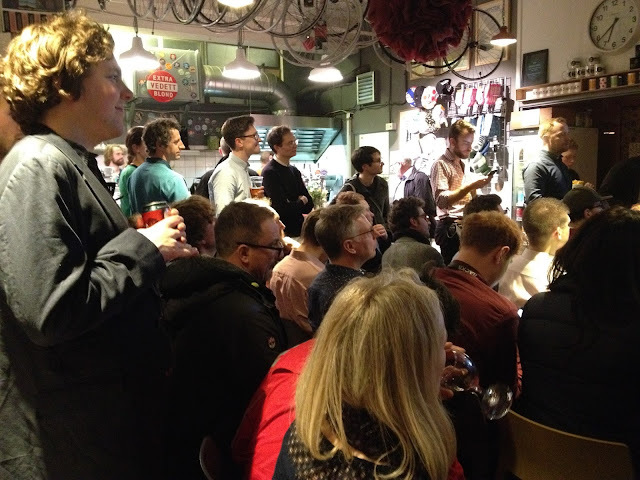 I didn't know about the pub meeting- there are so many thousands of cyclists in London, if they had actually advertised it better, they could have filled a hall. Thank you for the detailed article and reporting. I for one will be doing whatever I can to get these people to wake up to reality. I have to say, it looks to me like they made a bad choice when hiring this guy. For a cycling advocate, he seems to have very little to do with cycling. His employment history with Nike suggests his forte is marketing, and nothing else. What's more, his strategy seems to be to ignore what's happened under Johnson/Gilligan, especially the few things that have actually worked, and start from scratch. But first, do 'education' again (ie, more marketing). His previous experience was mainly concerned with laundering a [heavily soiled] corporate reputation—not marketing per se. It does rather beg the question as to why he, specifically, was recruited. If Val Shawcross was bought in to discredit the previous mayor's walking (and cycling) legacy by any means necessary, it might come in handy to have such a person. Alternatively, maybe they just wanted to keep him out of enemy hands or as a source of subs? Even the timing is quite fishy—don't forget that Bixi Johnson was angling to be national head of the tory ‘party’ by ~October 2016. To Rebecca Olds: more likely the audience just had a vastly different (wrong) understanding about what the ‘relevant issues’ were to Norman and Shawcross. There are advantages and disadvantages to a campaigning organisation like LCC being a charity. Being a charity does not prevent campaigning on political issues, but care must be taken not to be seen to be supporting any party. The pledge that the candidates signed was actually specific enough for a clear verdict to be taken in time on whether Khan has met it or not. 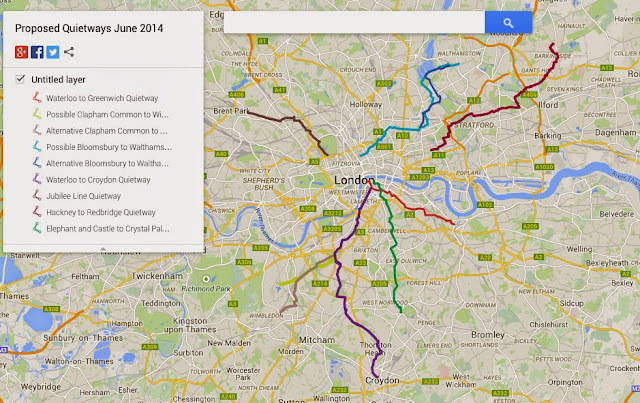 A tripling of the distance of segregated cycle superhighway is a numerical criterion. And, clearly, the point of a campaign like that is not to tell Londoners they can 'cheerfully vote for any of the main candidates', it's to impress on the candidates the issues and wishes of the members. In the end it's easy to carp from the outside. And I don't follow your complex conspiracy theories in your first paragraph. Yup, Khan will not create the political space to act and implement his stated policies. We need direct action to create that space and put pressure on him to act. We've been impressed here in the office with the amount of coverage the 9000 early pollution deaths a year in London have finally been getting but like you we've found it frustrating that the only cycling news in London has been about fatalities, which put people off cycling, rather than key announcements (action) from the Mayor. 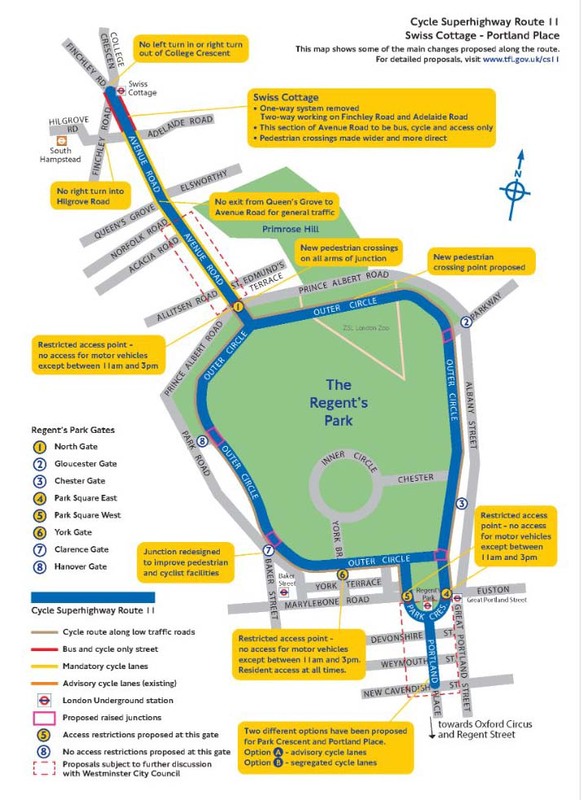 Btw, coming from a sports cycling background originally, you're right, that Regents Park proposal is absolutely dire. Keep up the good work, hopefully Will Norman will engage with you guys a bit more to get a real understanding of what can be done. Sounds like every single person in the audience knew far more about the relevant issues than Shawcross or Norman.